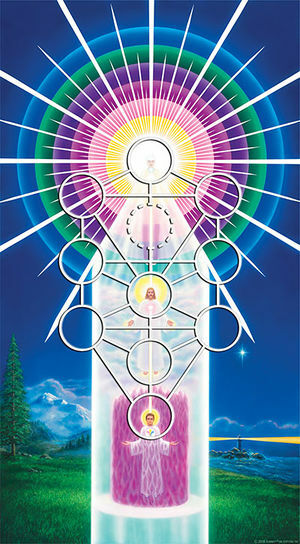 The sefirot are names which God gave to himself, each part of himself having a specific name with a specific vibration that we could access through the universal “computer” of the mind of God. The sefirot bridge the gap between the finite creation and the infinite God. Kabbalists have used many synonyms for the sefirot including: emanations, vessels, lights, stages, pillars, garments and inner faces of God. Each name describes another aspect of the nature and function of the sefirot. The term sefirot first appeared in the Sefer Yetzirah (the “Book of Formation” or the “Book of Creation”), the oldest known Hebrew text on cosmology. Tradition says that the priest Melchizedek revealed the teachings recorded in the Sefer Yetzirah to the patriarch Abraham, who either recorded them himself or transmitted them orally to his sons. Early Kabbalists made diagrams of the structure of creation as it progressed from Ein Sof down through the sefirot. The most common diagram is called the “Tree of Life.” Kabbalists conceived of many possible groupings of the sefirot within the Tree of Life. They also considered the creation of the cosmos to have resulted from the creation of language. Thus, they believed the twenty-two letters and sounds of the Hebrew alphabet were the instrument of creation itself. In addition to the ten sefirot, there is one “quasi sefirah,” which is sometimes described as a secret or hidden attribute. The power of thirty-three present in the Tree of Life derives from the twenty-two letters of the Hebrew alphabet, the ten sefirot and the one quasi sefirah. 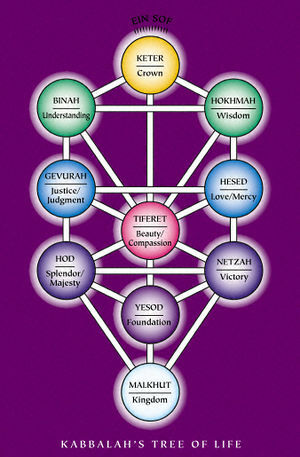 Keter (“Crown”) is the first sefirah, the highest sefirah on the Tree of Life. Keter corresponds to the I AM Presence in the Chart of Your Divine Self. Tiferet (“Beauty” or “Adornment,” also known as Rahamim, “Compassion”), is the sixth sefirah, located in the center of the Tree of Life. Tiferet is the mediator who brings into harmony the extremes of Mercy and Judgment and represents wholeness and balance. Kabbalists see Tiferet as the son of the sefirot Hokhmah and Binah, and the Zohar refers to Tiferet as the Son. The ascended masters teach that Tiferet corresponds to the Universal Christ, who is individualized in each of us as the Higher Self, or Holy Christ Self (the middle figure in the Chart of Your Divine Self). The tenth sefirah, Malkhut (“Kingdom”), also called Shekhinah (“Divine Presence”), is at the base of the Tree of Life. In Kabbalah, Shekhinah figures as the mother of the world. Malkhut/Shekhinah is at the nexus of two worlds, representing the point where spiritual and physical forces meet. In the world of the sefirot, she is the lowest point; in our world, she is the uppermost point. Thus Malkhut serves as both the channel through which the divine forces of the sefirot flow downward to this world as well as the gate through which we on earth reach upward to God. Malkhut is the gate we must pass through as we begin our ascent up the ladder of the sefirot to Ein Sof. Elizabeth Clare Prophet, Kabbalah: Key to Your Inner Power. Pearls of Wisdom, vol. 35, no. 59, December 2, 1992. Elizabeth Clare Prophet, Kabbalah: Key to Your Inner Power, pp. 23, 24. Pearls of Wisdom, vol. 38, no. 10, March 5, 1995. This page was last modified on 10 February 2019, at 03:34.